In a series of firsts, Egyptian teenager Amr Mohamed has won an international science competition, guaranteeing his contribution to a set of experiments scheduled to be conducted later this year aboard the International Space Station. Aimed at inspiring young innovators to design an experiment that can be performed in space, the YouTube Space Lab competition was open to teenagers aged 14 to 18 from all over the world, and further divided into two categories according to age and region. Mohamed, 18, and Americans Dorothy Chen and Sara Ma, both 16, were announced the competition’s winners at an awards ceremony in Washington, DC, attended by members of NASA, the European Space Agency and the Japan Aerospace Exploration Agency. 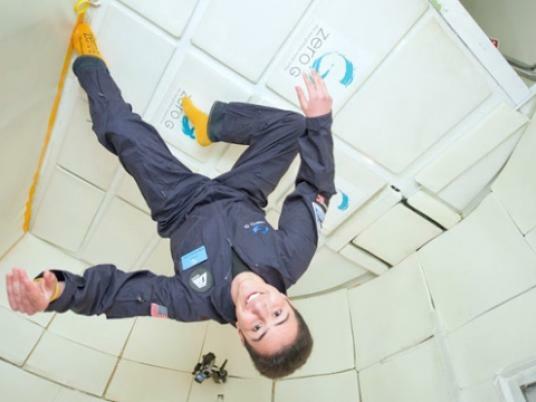 Mohamed had previously spoken to Egypt Independent to discuss his idea of studying zebra spiders in a minimal-gravity environment. Counted among the most common types of arachnid, the zebra spider swings from a thread in order to pounce on its prey — unlike most spiders, which spin webs to capture their victims. Mohamed’s hypothesis is that in the absence of gravity, the zebra spider will be forced to adapt. Should the future of the human race lie in space colonization, Mohamed argues that every organism — including the zebra spider — must be accounted for in the re-creation of our support system. More importantly, these creatures must be able to survive a lengthy trip through space.